Jenn had a great challenge for us this week. Use embroidery floss for something other than embroidery! Sounds like fun right? Our DT and Guest Designer did an AWESOME job AND PTI also gave lots of ideas in their March customer blog hop last month. So no excuse when it comes to inspiration. My entry for that blog hop is HERE. But this card is much nicer!! I decided against the typical uses like tying bows or threading buttons. It took me a while but I finally used the floss to cover these little wooden wings I bought on Etsy. I looped it so (hopefully) it would look like feathers! I hope I succeeded! I heavily CASED Melissa Phillips’ card HERE. Stunning, I love your style! very pretty. So whimsical – love it! As usual an AMAZING job on this 🙂 Guess who's featured over on my blog today? Yup! It's YOU. so cute Rebecca!! Great use of the floss on the wings!! Perfect!!! Pretty – gotta love some glimmermist! What an original take on embroidery floss – a very cool technique! 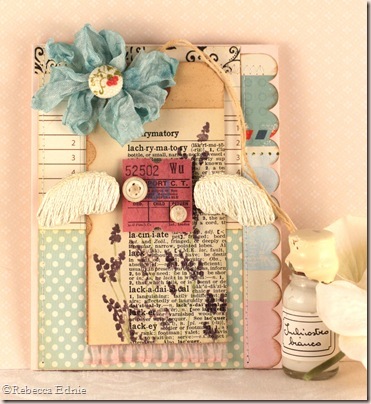 Your vintage-style card is just beautiful! You definitely succeeded with those wings! They look very feathery. Thanks for doing a great job with my challenge this week!